Democrats have brought in $7.5 million, while Republicans and unenrolled candidates have each raised $4.3 million, producing a $16.1 million total – more than double the amount raised at this point in 2014. Maine Democrats are soundly outraising Republicans in campaign contributions this election season, bringing in a total of $7.5 million to the Republicans’ $4.3 million, according to the latest campaign finance reports. Unenrolled candidates have raised $4.3 million, bringing the total campaign contributions by all state candidates this election season to $16.1 million with six weeks to go before the Nov. 6 vote. Democrat Janet Mills “has fundraising momentum going her way,” says a political finance expert from Maine. That’s more than double the $7.7 million raised at this point in 2014, and far more than the total election cycle spending of $9.4 million. Outside spending, largely by Democrats so far, is pumping additional millions into the governor’s race alone. Democrats also are getting a boost from the current political climate – from opposition to Donald Trump to pent-up demand after two terms of Republican Gov. Paul LePage and increased activism that has fueled an unprecedented number of female candidates here and nationwide. Moody, a Republican, and Mills, the state’s Democratic attorney general, were in a statistical dead heat in the race, with 39 percent each, according to a Suffolk University poll conducted in early August. Hayes and Caron, both independents, trailed at 4 percent and 3 percent, respectively. Mills raised almost $800,000 in the past two months, more than twice the amount raised by Moody, according to campaign finance reports for state candidates filed Tuesday. The two candidates both have about $400,000 cash on hand as they head into the final heated weeks of the campaign. Overall, Mills has raised $1.8 million to Moody’s $1.4 million – and that was after Moody put more than $500,000 of his own money into his campaign. Moody has raised $367,000 in the past two months, according to reports filed with the state ethics commission for the reporting period from July 18 to Sept. 18. The spending in the governor’s race already has outstripped spending in the last election cycle. In 2014, the three major candidates for governor – LePage, Democrat Mike Michaud and independent Eliot Cutler – combined to spend $7.5 million, up from the $5.1 million that LePage, Cutler and Democrat Libby Mitchell spent in 2010. Caron is largely self-funded, loaning his campaign $240,000 in the most recent filing period. That brought the total amount of personal loans that he and his wife have made to his campaign to $725,000 out of the $785,240 that has been raised in total. Hayes – the only gubernatorial candidate using Maine’s public campaign finance system – reported another $260,000 in public funds for the period, for a total of $1.1 million in Clean Election funding. In addition to campaign fundraising, outside spending is already higher than usual – and will get more intense in the upcoming weeks, Corrado said. “We have seen a significant amount of early independent spending, and we can expect to see a major surge in the next three weeks,” he said. The Maine Republican Party has spent more than $500,000 in the governor’s race, according to state campaign finance reports. So far, most of the outside spending in that race has been from Democrats. In recent weeks, a Democratic Party-backed political action committee, A Better Maine, topped $1 million in overall spending on the race. 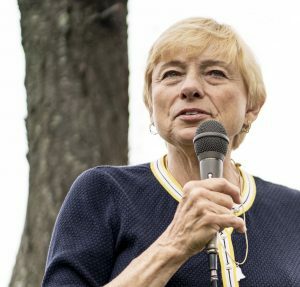 In 2014, these outside groups – which cannot coordinate with the campaigns – spent more than $11.6 million on the Maine governor’s race, aided in large part by U.S. Supreme Court rulings that eliminated any contribution limits. In 2010, $3.9 million in PAC money was spent on the governor’s race. Republicans tend to go heavy on outside spending in the last few weeks of a campaign, Corrado said. The Clean Election funding also is shaping the races. Statewide, there are 210 active Clean Election candidates this election season, including the primary. There were 139 Democrats, 55 Republicans and 13 unenrolled candidates using the public campaign finance system. Democratic candidates received $3.1 million, Republicans received $1.4 million and independents received $1.3 million.